The Light Tank M24 SDF is a Rank III Japanese light tank with a battle rating of 3.3 (AB/RB/SB). It was introduced along with the initial Japanese Ground Forces tree in Update 1.65 "Way of the Samurai". This Japanese vehicle is identical to the American M24 Chaffee. 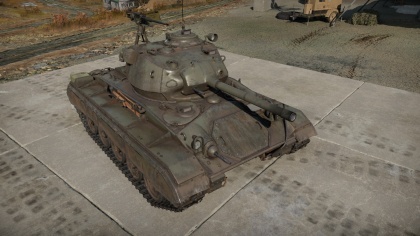 The M24 (Japan) is a very good tank with a fairly interesting play style. Instead of being permanently stationed at a single point and continuously firing at an enemy, this tank offers impressive maneuverability and speed which allows it to perform impressive flanking maneuvers. The M24 can travel at around 38 km/h forward and -25 km/h backwards. Its reverse speed is very good if a quick getaway by going backwards is needed. 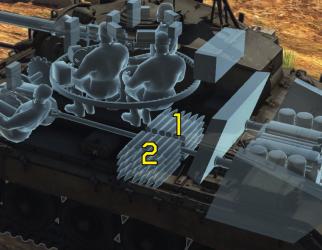 Thus, this tank excels at "peek-a-boo" tactics in which one hides behind a rock or other large piece of cover and repeatedly inches out to fire at an enemy. As early as 1942, the light tanks M3 and M5 Stuart have been seen as severely lacking in the modernizing design of tanks and how they fight. The armour was seen as insufficient and the 37 mm gun was also deemed useless against newer German tanks like the Panzer III and Panzer IV. The system needed an upgrade, specifically a light tank that mounts the 75 mm gun seen on the Shermans. An attempt to mount a 75 mm gun on a Stuart was deemed inefficient as it reduced ammo stowage and left the armour too thin on the design. In April 1943, Ordnance with Cadillac started on a project for the new light tank, designation Light Tank T24. The powertrain and transmission of the M5 Stuart was used with the ultimate goal of producing a vehicle weighing less than 20 tons. This left the vehicle with relatively thin armour to keep light. At the time, a lighter 75 mm gun was developed for mounting on the B-25 Mitchell bomber without sacrificing performance, and this was mounted onto the light tank in development. The tank used 410 mm wide tracks with a torsion bar suspension that greatly improves cross-country travel. The engine was a Cadillac 44T24 V-8 petrol engine. The chassis was designed with the expectation that it would be used as a basis of many different vehicle roles so it was called the "Light Combat Team". The light tank end design had a low profile at 9 ft. 1 in. height and featuring a crew of five with a three-man turret, an improvement over the two-man turrets of the Stuarts. The first finished vehicle arrived on October 15, 1943 and was deemed a success, starting a contract for 1,000 units that was later raised to 5,000 units. The vehicle was classified as the Light Tank M24 and as the Chaffee by the British after US General Adna R. Chaffee, Jr., who helped develop some of America's earliest tank designs. The vehicle was produced by Cadillac and Massey-Harris from April 1944 to August 1945 with a total of 4,731 units produced. In July 1st, 1954, Japan set up its post-war military force, the Japan Self-Defense Forces with the purpose of defending Japan should it come under conflict in the ongoing Cold War between America and the Soviet Union. 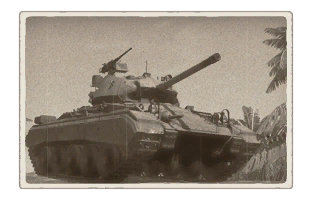 To jump start the remilitarization, America gave the newly formed JSDF several M24 Chaffees along with some M4A3E8 Shermans. The M24 would soon be retired once it was found that they were unable to contend against the Soviet's T-34-85, leading to a limited use until replaced by more capable tanks.